The Border Terrier is fearless, lively, affectionate, good-tempered and obedient. He's active without constantly demanding your attention. He can be laid back in the house, then wonderfully energetic outside. He's cheerful and friendly and loves to play. He's very sociable with strangers, and excellent with children as long as they are respectful to him. He doesn't mind being left alone, but he also needs plenty of hugs and cuddles from his family. He is a strong dog with a lot of energy and stamina. He loves vigorous, outdoor activities like hiking and biking. He should be kept firmly on his leash when outdoors, because he likes to chase small animals. He doesn't do well with small pets in the house, although he should be fine with a cat if he's raised with it, and he gets along well with friendly dogs. While generally not yappy, he is very alert and makes a good watchdog. He's sensitive to new sights and sounds: he will bark to let you know whenever something new is happening outside the house. If you have a yard, you might need a fence with a reinforced bottom, because he likes to dig holes! He can be independent and strong-willed, but he is also easy to train, adaptable to your needs, and eager to please. He is a very low shedder, and would make a good pet if you like your home on the neat-and-tidy side. 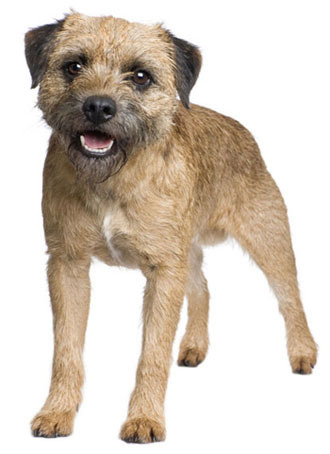 The Border Terrier is 10 to 16 inches tall (to shoulders) and weighs 13 to 25 pounds. He has a short, wiry coat consisting of a short, soft, dense undercoat and a wiry topcoat. His coat color can be red, gray and tan, blue and tan, or wheat-colored. You only need to brush his coat occasionally. Pet coat: Clipped short every few months. Show coat: Stripped (dead hairs plucked out) every few months. One of the oldest terrier breeds in England, the Border Terrier gets his name from the border region between Scotland and England, where he was first used to kill foxes and rodents, then later by shepherds and farmers to guard their stock. He was a relatively unknown dog until the breed was registered with the English Kennel Club in 1920. The first Border Terrier Club (England) was also formed that year. He was registered with the AKC in 1930, and his AKC popularity was 81st out of 157 breeds in 2007.